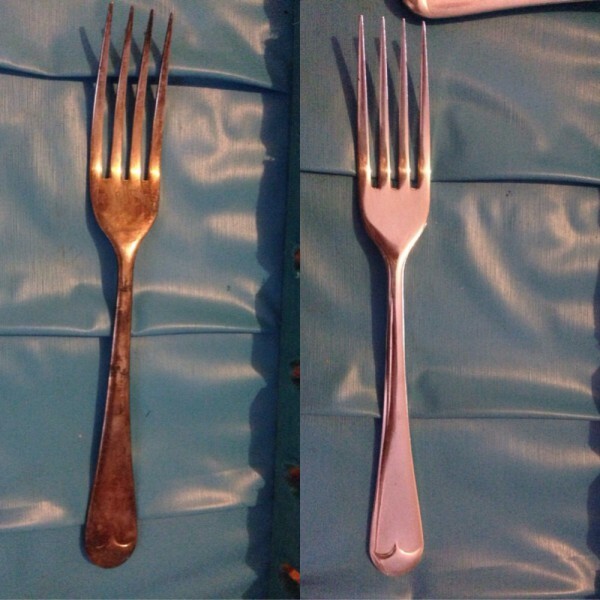 I have a silver cutlery set handed down to me from my grandma and its a little tarnished and brown in spots, does anyone have a DIY silver cleaner recipe they would be able to share? You can’t go past toothpaste, it’s brilliant. 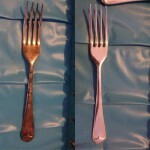 Make sure you don’t spill it on some types of metal because it will rust it or paint – it will peel. Apparently coke will clean oil stains off cement. It will put a small vehicle fire out too, especially on a motor bike…but..expect it to rust. Surprising what you learn from people in any type of metal trade including mechanics. I heard that lightly polishing with toothpaste works well on silver. You can buy silver cleaning cloths. They are quite good and more gentle than the pastes. Always wear rubber gloves. Silvo in a can is also very good but can get a tad messy! Hope this helps. Wow what an amazing transformation! Good advice! So glad you discovered this method, it really is amazing and sooo cheap. I will have to give the foil a go – I wonder what the science is behind this? Ive seen the foil and bi-carb soda idea used on TV and it seemed to work pretty well. The coffee mug of microwaved hot water, place a circular piece of foil, 1 tablespoon of Bicarb of soda & 1 tablespoon of dishliquid. Dip your silver in for few minutes & it works for gold jewellery & rings. Amazing results & cheap!